The Quinnipiac men’s basketball team (9-9 overall, 4-3 MAAC) will seek to win its second straight MAAC victory as it takes on Saint Peter’s (9-12 overall, 3-3 MAAC). Each team comes in sitting in the middle of the MAAC standings, with Quinnipiac in fourth and Saint Peter’s in seventh. Young has been the consistent stud on this team, averaging 20.4 points per game – a number that leads the MAAC. After securing 29 points in the Bobcats’ win against Marist on Friday night, Young is 11 points shy of the 1000-point threshold. He is a player who loves to shoot the ball as he’s taken a team-high 255 field goal attempts, far ahead of the next name in that category (Tyrese Williams with 144). He has been Quinnipiac’s top scorer and there is no reason why he shouldn’t lead the offense again and meet that 1000-point milestone. Right behind Young in the MAAC for average of points per game is Turner with 18.3. Similarly to Young, he is the team’s clear-cut top option when it comes to the offense. He leads the team with 274 field goal attempts, which is more than 100 more than the next best. Not only that, but he can dish it as well, as he leads the Peacocks with 52 assists. The battle between Young and Turner should be a must-watch. Quinnipiac loves shooting the three-ball. The problem is, some games it’s there and some games it’s not. Quinnipiac is coming off a 15-for-32 performance against Marist, shooting 46.9% behind the arc. In addition, Saint Peter’s is the worst in the MAAC at defending the three, with opponents shooting 39.5% from distance. If the Bobcats can continue that success into Sunday, it has to chance to challenge their season-high point total of 92 that it put up on Friday and run away with a win. Saint Peter’s is second in the MAAC in terms of opponents’ rebounds with an average of 32.7 per game. 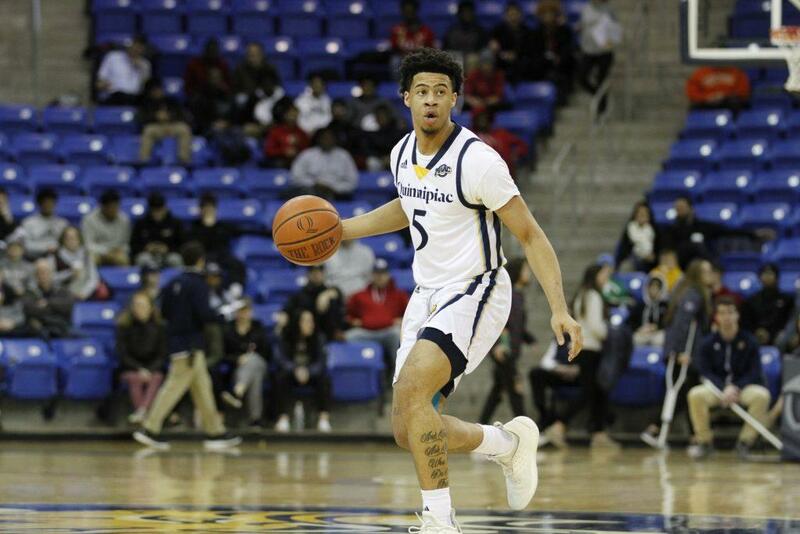 Quinnipiac scores higher in both offensive and defensive rebounds than Saint Peter’s, but with Quinnipiac’s junior forward Kevin Marfo easing back into play because of an injury, that could give Saint Peter’s an opportunity to seize control of the rebounding. Saint Peter’s cannot let Quinnipiac get second chances on the offensive side. Be sure to tune into the broadcast of the game between Quinnipiac and Saint Peter’s at the People’s United Center at 2 p.m. on Sunday. On the call will be Jonathan Banks, Kevin Higgins and Bryan Murphy. To receive updates on the game, follow @QBSN on Twitter.